Tea-Time Friends (TTF) was a collaborative project brought to life. Five days were spent using the space as a studio, where various work was created. On the final night, the space transformed and was opened to the public. A complete range of promotional gear was designed by myself, alongside a visual identity which carried through into the week-long event. Mushdog is an exploration of self identity and sexuality. The vector illustration was created and exhibited during the week event of 'Tea-Time Friends.' 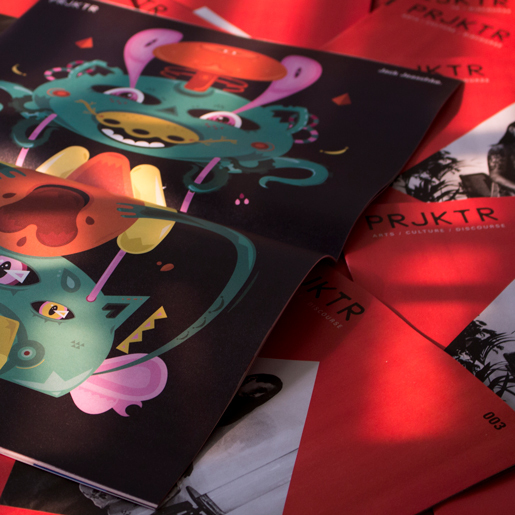 The piece was also featured within the centre-page foldout for PRJKTR Mag Issue #003 and the first edition of Toy Boy. The layered character design is a reflection of my own sexuality; illustrating two beasts, tied together within a power struggle. The power of imagination is visualised through the photographic series, Paper Worlds. Ethereal characters tower over the constructed worlds, enveloped physically, illustrating the connection between body and one's mind. Werld is both a digital and hand drawn animation. The piece was produced as an artistic collaboration between myself and a visual/sound artist. The short, looping animation explores human influence upon a once organic world. The life cycle of this dystopian world playfully bounces between repeating visuals and an evolving soundscape. I’m a Melbourne based graphic designer and illustrator. With a meticulous eye for detail and a blend of whimsical and mature; my digital illustration and design is built upon precision, curvature and balance. Eager to challenge myself and push my horizon further, I strive to absorb new surroundings, and strengthen myself as a creative. With my pens and paper in one hand and a mug of tea in the other, I’m ready to share my experiences through my design work, with friends and clients alike.